That little, yellow munching ball of the arcade world leapt to the television screen with the animated Pac-Man. As addicting as the arcade game was, it was a little thin for a half-hour series, so Hanna-Barbera decided to expand on the premise. Joined by Ms. Pac-Man, who was now Pac's wife, as well as the newly created Baby-Pac, Chomp Chomp the dog, and Sour Puss the cat, the Pac family lived in Pac-Land (making "Pac" the most overused word since "Smurf"). Near their home was the Power Forest, where Pac-Man worked as chief of security, guarding the precious power pellets that grew there. These pellets, the source of all Pac-power, were coveted by the evil Mezmaron, who constantly sent his ghosts Inky, Blinky, Pinky, Clyde, and Sue after them. Unlike the arcade game, Pac-Man would only attack the ghosts defensively, since this was an era of toned-down violence in cartoons. When necessary, Packy would chomp at the ghosts and force them to disappear, until they could recharge themselves with a new ghost costume from Mezmaron's wardrobe closet. The second season paired Pac-Man with another 80's fad-inspired cartoon, Rubik the Amazing Cube. On Pac-Man's own show, the family gained a powerful new friend in Super Pac, who by that time was the star of his own arcade game. 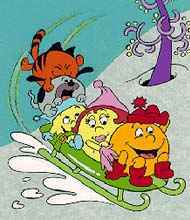 In an odd case of game becomes 'toon becomes game, the animated Pac-Man spawned a video game of its own, titled Pac-Land. Though graphically superior, the side-scrolling adventure game never caught on in the same way as its simpler, yet undeniably infectious predecessor.